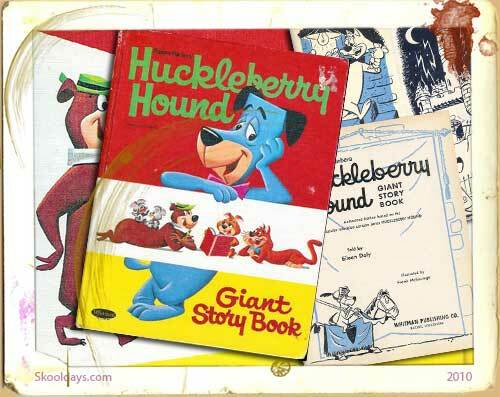 Huckleberry Hound: Giant Story Book from Whitman Publishing is a book i’ve tried to track down for 20 years. Then suddenly on Flickr I came across it. This great nostalgic book is quite a collectable as it dates back to 1961. The book is full of all the Hanna-Barbera’s cartoons. Unfortunately its all in monotone colour and for a kid that was always a disappointment. If you love Hanna-Barbera’s The Huckleberry Hound Show you will love this book. A recent one on ebay remarkably went for just a few pounds.That listing is for a 1961 Hanna-Barbera Huckleberry Hound Giant Story Book in Hardcover. The book had 190 pages and appeared to have had some of the back pages missing. There was some yellowing/browning of the pages and definite binding issues. But even so good value in my mind. The interior artwork is illustrated by Frank McSavage who does a great job with H-B’s character designs. Here are some examples of the illustrations that are found through-out the book.The 192 page book is also a fun, retro read since a lot of the classic cartoon action, violence and sterotypes are still intact as you read it. This entry was posted in Cartoon by Skooldays. Bookmark the permalink. I have the book with no pages missing and also in near perfect condition.